In a matter of hours I will help my girls get ready for the last day of school before summer break. It’s hard to believe that summer 2012 officially starts for us in less than 12 hours when that final bell rings and all the kids flood out of school to waiting parents or the big yellow buses who will take them home. 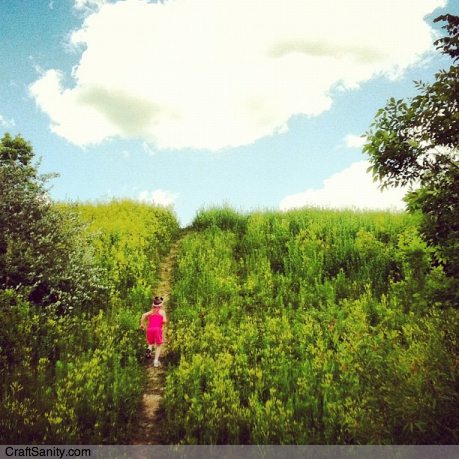 Amelia and I started our summer adventuring a day early and ran up the most excellent hill pictured in the photo above. Amelia cruised right up laughing the whole way. I ran 5 miles before our hike, so I went a bit slower and focused on keeping my iPhone camera steady. When the sky is blue and the clouds are out, I always have to snap some pictures. Then after we party for a bit, I will finish making looms for Sunday’s opening of the Fulton Street Artisans Market. I’ll be in booth 40 selling looms, magazines and recruiting folks to help me weave another “dream house” that will be on display at Maker Faire Detroit at the Henry Ford Museum in Dearborn on July 28 & 29. Stop by my booth Sunday, weave a square and tell me about what you make. Bring show and tell. It will be fun. Ok, I gotta go pack the car for tomorrow’s 9 a.m. craft segment on WZZM Channel 13’s “Take Five” morning show. I’ll be previewing the Fulton Street Artisans Market and showing samples of some of the handmade goods that will be for sale. Some of the samples are breakable, so wish me luck.